Description:- The limited edition flavour is light and fruity, perfectly refreshing on a sunny day. 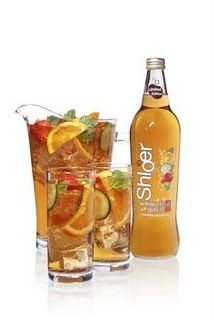 Blended from white grape juice and fruit concentrate, Shloer’s Summer Fruit Punch is best served “dressed to impress”. Conjure up the typical tastes of summer: mint leaves, slices of orange and cucumber and fresh juicy strawberries, all served in a jug over ice – perfect for sharing. Review:- You may remember that I reviewed some other flavours of Shloer recently here. I was sent a bottle of Shloer Summer Fruit Punch to try. I have to say I wasn’t keen on this flavour. I loved the other flavours I tried the White Grape, etc. I have even bought several more bottles since but this flavour I didn’t take to. Hubby on the other hand didn’t like the White grape but liked this one. When I added some lemonade it was much nicer and I enjoyed it. However I’m not sure I will by it again. The other flavours white grape, rose and red grape are sort of like non-alcoholic wines, just slightly sweeter. They are delcious. There are many receipes you can check out and further information on their flavours can be found out here. There is a Sunday Cookbook here. I would recommend the Shloer range to everyone, it’s a little treat and so yummy. The new Summer Fruit Punch was not to my taste but it might be yours so give it a go. Disclaimer:- I was sent a bottle of Shloer Summer Fruit Punch in exchange for an honest review.